A well-rounded meal is never complete without some greens. We feel the same way when hosting a get-together or movie party as well. Therefore it stands to reason that our second recipe in our trio of recipes for Rogue One: A Star Wars Story would be a veggie dish. 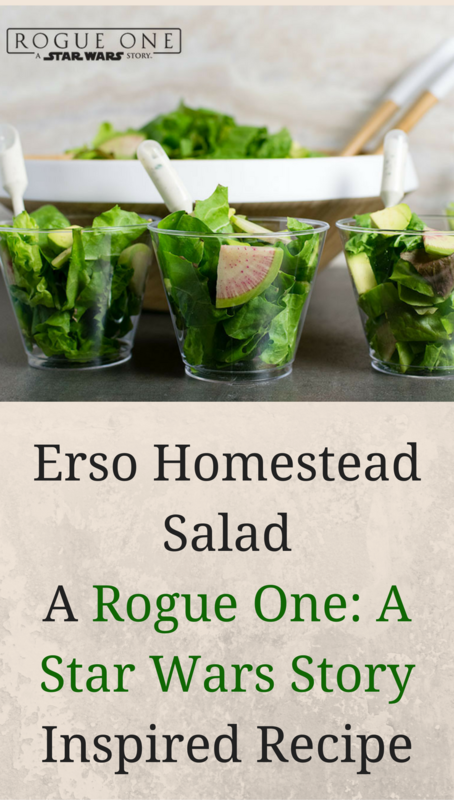 Rather than doing something like a veggie and dip, we came up with The Erso Homestead Salad. When coming up with the theme for this recipe, we looked at the Erso’s home on Lah’mu. Lah’mu is located in the Outer Rim’s Raioballo sector. It is a sparsely inhabited planet whose rich soil and groundwater are contaminated by minerals and other elements. We liked the idea of a salad because it felt like something the Erso’s might grow after reinventing themselves as subsistence farmers while hiding from the Empire. 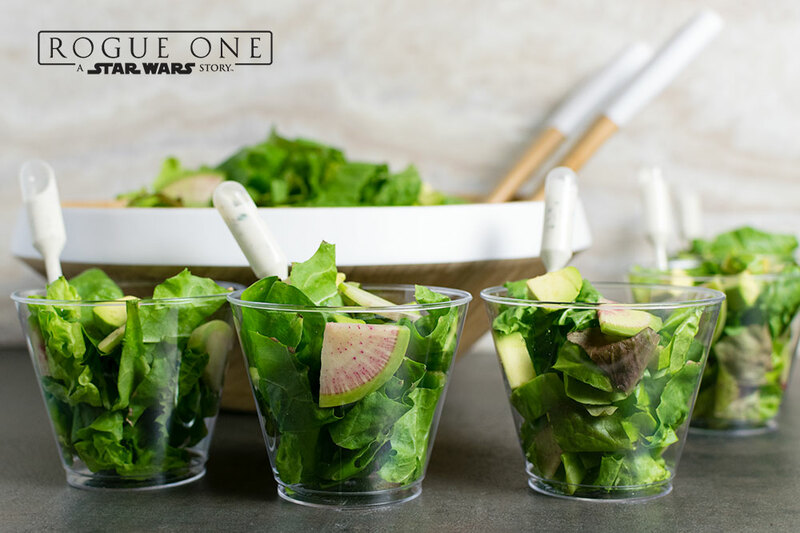 Ingredients wise, we tried to stay with what we’d imagine a farmer’s salad to be in a galaxy far far away. We used watermelon radishes for their unique look and green leafy lettuce for its flavor. We also created a Light Side Dressing which features non-fat Greek Yogurt. What’s the point of a salad if it isn’t at least a little bit healthy? 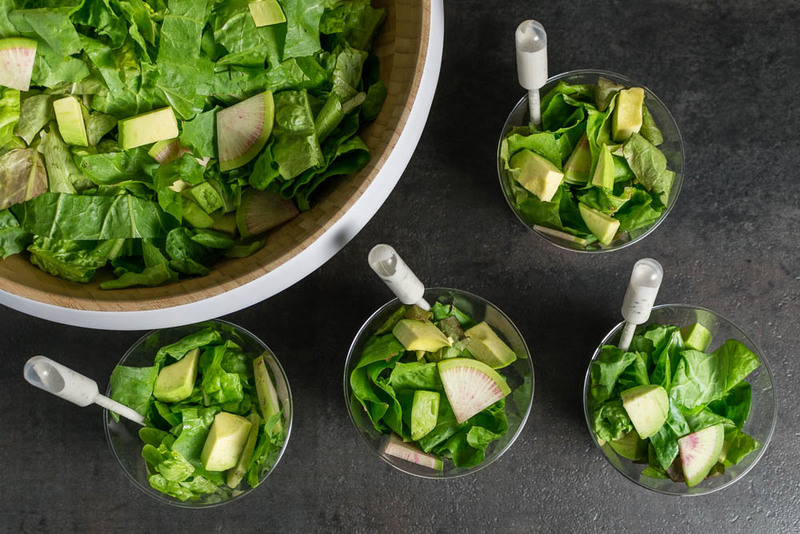 The fun thing about this salad is it can be served family style or you can serve it in individual cups. We used pipettes to hold our salad dressing and keep our lettuce dry. Nobody likes a soggy salad! We hope you’ve enjoyed the second of our 3 Rogue One: A Star Wars Story recipes. There is only one more left! Can you guess what it will be? Don’t worry if you miss one as we will be resharing them next Tuesday along with a review of the Blu-ray! Combine dressing ingredients and refrigerate for 30-60 to let flavor develop. If serving in individual cup, portion them out. Serve dressing in pipettes to prevent the salad from getting soggy (or serve it on the side in a bowl).